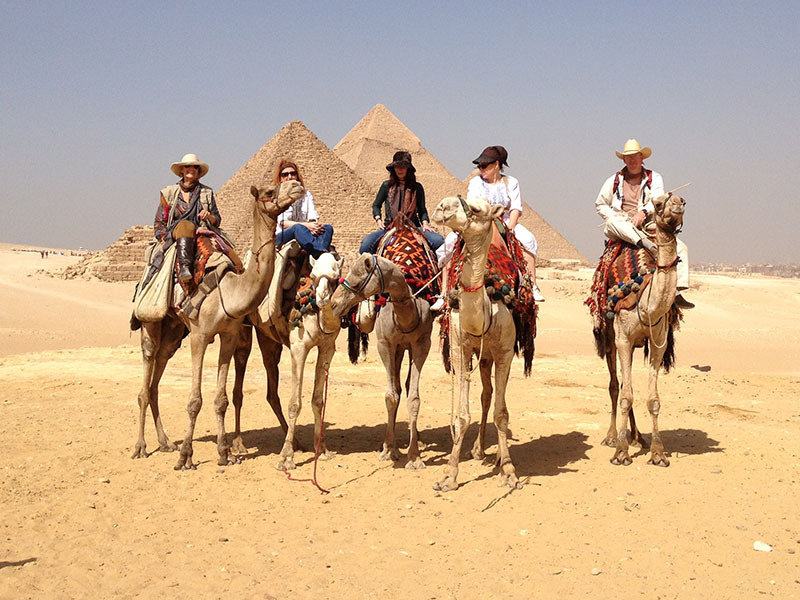 Egypt, Sinai, and Jordan trips are based on home-stays, living with locals in modern Cairo and Bedouin in the historic Sinai, combined with more traditional tourist accommodations in Jordan. During your time in Egypt, Sinai, and Jordan you’ll trek on camels, visit the Pyramids of Giza, the Egyptian Museum and explore nearby Jordan, but it’s the people you meet (and live with!) that will define your experience. They are the true heart of the Middle East. This will be unlike any other travel you’ve ever done- the majority of the time you’re living in Egypt/Sinai, eating what the locals eat, experiencing a side of Egyptian and Bedouin cultures that no large groups could possibly see. Only a handful of nights will you be in tourist accommodations- the rest of the time you’ll experience Egypt and Sinai just like the locals, because that’s whom you stay with. From the donkey carts in the streets to the various vendors in the neighborhood; from Ahmed the neighborhood baker to the neighbor lady across the street who loves to practice her English. Every sight, sound and smell will become familiar to you. Beware! It may be really difficult to readjust to your former life when you return home. In Egypt/Sinai, you’ll experience the Sphinx and Pyramids of Giza, trek the historic Sinai desert, visit the medieval quarters of Cairo, take a day-trip to Petra in Jordan, snorkel or dive in the Red Sea, hike up Mt. Sinai and more! All of the above sites and activities are incredible and defy description, yet I propose something even greater will stick out in your mind as THE highlight of your trip: The truly lasting memories will be of the people you live with in Egypt and in Sinai. From the Muzeina Bedouin, the family of Saleh bin Suleiman, our host in the Sinai desert and in Cairo, the family of our host, Adel Said Hamza. Your participation is so important to my two “families” and the financial impact this has for Saleh’s and Adel’s homes is inestimable. 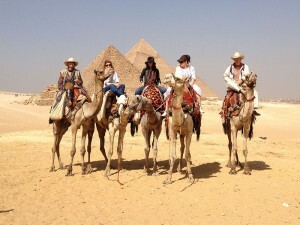 No visit to the Pyramids of Giza is complete without a camel ride into the Sahara. This vantage point, to the southwest, is very popular and affords a view of the entire plateau. This is truly a one-of-a-kind experience that puts you in the homes of people I consider kin. With this comes responsibility, of course. A willingness to be flexible and the ability to overcome some culture shock are vital, but I also consider our group to be “ambassadors” of sorts. We won’t just make an economic contribution to Adel’s and Saleh’s families, we’ll also be demonstrating that Westerners have the same set of values that they do, that we’re much more alike than we are different. Saleh and his wife Freija and Adel and his wife Suad take great pride in having you in their homes; we should reciprocate by being good guests. Please consider all the areas I cover in the following pages, to make sure this experience is right for you and that you’re right for this experience. have a great trip, so what do I offer that’s so different? Personal relationships. 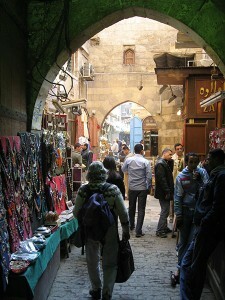 Billions of tourists have seen the Pyramids and King Tut’s treasures. Very few travelers have the opportunity to get so close and personal with the true heart of Egypt and Sinai: its people. It’s an obligation to you, my guest, to share the same warmth, hospitality and depth of generosity that I experienced on my first trip back in 2001 when I was simply looking for more knowledge about camels. What I got was so much more. It is my intention to share a part of the world with you that I’ve encountered- Bedouin and Egyptians who have become family to me and places we’ll visit that now feel like home each time I’m there. This is the Egypt and Sinai I hope to share with you.